TechDays is now in full swing. Vancouver and Toronto have both been completed and have gone well. The remaining cities are coming along in November and December. I will be presenting three sessions in Ottawa this year. Two sessions are part of the Windows Client track on Day 1 and one is in the Servers, Security and Management track on Day 2. Windows 7 is finally out and the wait to deploy is over. Now what? How do you get Windows installed on 10 or 100 or 1000 desktops with all the drivers and applications required? Attend this session and get ahead of the curve and be prepared to walk through installation, image creation, and deployment scenarios. Maintaining user profiles and data is critical to a successful deployment of Windows. This session shows how Windows User State Migration Tool (USMT) 4.0 can be used as an integral part of a fully automated deployment environment. The session covers advanced techniques for migrating user files and settings, including modifying and troubleshooting user state migration. You’re using WSUS, but are you using it to its fullest extent? In this tips and tricks session, learn the best ways to architect and implement WSUS for the improved security of your organization. Learn the best ways to manage your updates on both servers and clients for high-reliability application. Plus, learn a few tricks to speed up the update installation process, as well as ways to enforce that updates are installed to computers in your environment. 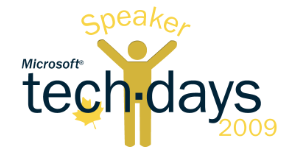 Be sure to sign up and come out to the TechDays event in your area. 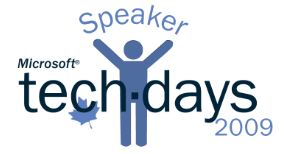 I think you will find the information being presented useful, and you will be able to take what you have learned at TechDays and use it back in your own environment.